"Letting go and realising that some things are part of your history, but not part of your destiny, will give you the courage you need to move on." 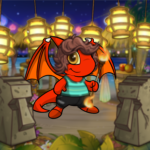 Once he overheard his Neofriends saying there was a peculiar looking petpet that resides in it, he knew he had to visit. 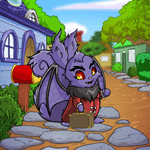 He retrieved 400 Neopoints from his coin purse, the customary entrance fee one has to pay in order to enter, and tossed it into the waters. Once the fee was paid for, his adventure had begun! "Well," he mumbled to himself, "my best bet is probably to start with the Second-Hand Shoppe. Maybe they won't care what colour I'm painted." The next morning, I pack my bags and take Flintley's journal in hand. When my search for the farmer yields nothing, I step outside the house and shield my eyes. This time we're focusing on the new species that's best described as being what would happen if you fed an Oukin some fungus from the Fungus Caves, the Vandagyre. November Y16 marks the fifteenth birthday of Neopets as a whole. To celebrate the occasion, there was an entire week of news dedicated to improving the daily life of the everyday Neopian.